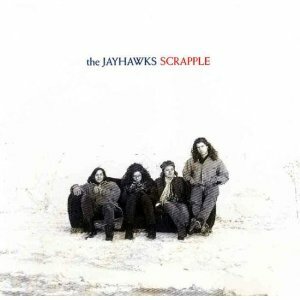 Minnesota's Jayhawks are one of the best things to come out of the '90s. The harmonies of Mark Olson and Gary Louris are the closest thing contemporary music has to the Everly Brothers. Their songwriting blends melodies that are instantly indelible with lyrics that reveal their mysteries only after many listens and time to reflect. Their ensemble playing pairs a muscular crunch with a nimble, light touch, sometimes in the same song. What we have here are 11 tracks culled from cd singles and a promotional EP released in conjunction with their two classic albums, Hollywood Town Hall and Tomorrow the Green Grass -- except "Sleepyhead", an outtake from their tepid, Olson-less Grass follow-up, Sound of Lies . My favorites are covers, "Last Cigarette" (by that great songwriter, Anonymous), sung by the band's keyboard player Karen Grotberg, and a romp through gospel standard "Up Above My Head". For those who love the band's elliptical songwriting, though, "Keith and Quentin" and "Leave No Gold" are up there with any originals on Hollywood -- though perhaps not those on the near-flawless Green Grass. Speaking of which, also here is an example of one of my favorite rock phenomena, a non-album title song, to go with that very album. The live tracks give a taste of the band's onstage power. A flyer included with The Jayhawks' new reissue of their previously very rare, self-titled debut disc touts forthcoming "deluxe" reissues of those two great albums, HTH and TTGG, and most if not all of these tracks will likely appear there. Meanwhile, though, here they are on The Rare Stuff! Wow! First REM and now the Jayhawks. It was worth the wait between posts. Thanks for your hard work and good taste. Just a thought though...any rare stuff from Blue Rodeo? Nice -- I wondered how I'd ever find these. And I must be the only one who actually likes the Sound Of Lies album. Well, at least it's not as bad as Smile (the Jayhawks' Smile, that is)! And I've never really gotten into Blue Rodeo, 2of3, so I don't even have any non-rare stuff of theirs! Thanks for the suggestion, though. You're welcome OleD and Gabriel... I did need a breather after the Del Amitri series but it's good to be back. I quite liked Sound Of Lies. Current solo stuff is dreadful though as is the wearing of tank tops. Fully with you on Smile though! Oh shoot, my review of Smile from the local weekly is no longer online, I was gonna copy it here -- it was pretty vicious, but hilarious. The closing line was the zinger though. I compared Mark Olson's lyrics to zen koans, and then said that this album without him "poses a far more pedestrian question: What's the sound of one band crapping?" That's just made me laugh out loud. That's the idea! :^) Also, anything, my email is in the "about me" box to the right! I love sound of lies. Salvation Blues is a very nice album, and I especially love its hardcover-book packaging. Vagabonds I never quite got into. Then there are the series of albums Mark did with Victoria Williams which are pretty hit-or-miss on a song-to-song basis (and as far as I remember, more miss than hit). And what did you think of the Olson/Louris Ready for the Flood? I didn't listen to it enough to form an opinion, which is an opinion in itself I guess -- not as compelling as the Jayhawks' work, I think. Perhaps I should give Lies another try. At the time, I was just very cynical about them keeping the Jayhawks name after they'd already announced they would be changing it. Kind of like Pink Floyd continuing without Roger Waters. I listened to it once since then and it still did not engage me. I just think Louris isn't enough of a songwriter to carry a whole album by himself, and one of the great things about the 'hawks is that they were one of few bands these days built around multiple songwriters instead of just one person's vision. Even the Beatles needed Lennon AND McCartney! Kewl, thanks for the comment Troy, I can't wait for those deluxe editions either! I sadly missed out on the 3CD+DVD limited edition of their best-of comp, and now it's changing hands for over $100 online! Maybe one day, a copy will come my way. Sent an invite annd email if you want a browse. Keep up the sterling work. Being a big jayhawk fan, and a Mark Olson and Gary Louris solo work fan, I was a bit disappointed in Ready for the Flood. Perhaps my expectations were way to high. I pre ordered it as soon as I heard about it and couldnt wait for it. Then, it was a bit of a letdown. Im hoping to "re discover" it after a while with normal expectations and I hope it will grow on me. If you didnt like Vagabonds at first, try to get "Acoustic Vagabond", which is a short acoustic ep with stripped down versions of some of the songs. Maybe that may sway Vagabonds more to your likings. I know exactly what you mean about RFTF! I was very disappointed at first, but hope I might find good stuff on it down the road. But it's no Jayhawks album. Just stumbled onto your site. Thanks for posting this. I'm looking forward to the new releases. I dig THE RARE STUFF!! discovering just what a nice site you have here. some very special shares. thanks for this one particularly.